Printing custom water bottles for special events, promotions or just to have in the office for thirsty clients is friendly and effective advertising. Everyone gets thirsty. Offering bottled water at trade shows, sponsored community events (like 5K fun runs), or in company/client meetings leaves a positive impression. You can choose from two different types of labels for water bottles. Both of these types of labels are permanent adhesive stickers and work best when applied to the smooth-edged area of water bottles rather than ridges. 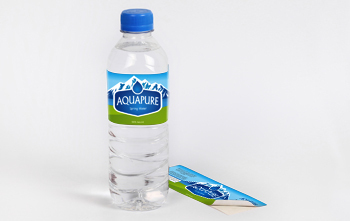 We offer durable material options for custom water bottle label printing. There are different choices for cut-to-size and roll. Full color printing is available for all options. What other paper stock options are available for water bottles, and what should I use? What do you need to know about coating options? Not all water bottles are shaped the same. We offer four different shapes of labels. For each of shape, you can choose from a wide range of sizes. There are some important things to keep in mind when selecting size. Do you want the label to wrap completely around the bottle (full wrap) or partially around the bottle? Are there any ridges on the water bottle? A flat surface is needed to affix the labels. Tip: The most popular sizes are 2” tall x 8” wide for a full wrap and 2” tall x 4” wide for half wrap. Get quality water bottle labels printed fast! Next-day printing is available for cut-to-size labels. Can I create a water bottle label in a custom shape and size? Yes, both cut-to-size and roll labels can be contoured to any shape, including your logo. Can I create a water bottle label design on the site? Yes! Choose the Create Design Online button in Step 2 - Upload Artwork. You can browse through existing designs and pick one as a template. You can also choose to Design from Scratch. How do I select the right size for my water bottle? Water bottles come in all different shapes and sizes. With that in mind, it’s important that you pick out your water bottle before selecting the label. The most popular sizes are 2” tall x 8” wide for a full wrap and 2” tall x 4” wide for half wrap. Measure the height and make sure the label height size you choose won’t go over any ridges. The label sticks best to a flat surface. Measure the circumference of the bottle to determine the label width. Decide if you want the label to wrap all the way around the bottle (full wrap), half way around (half wrap) or some other partial distance. Water Bottle Labels is rated 4.3 out of 5 by 20. Rated 4 out of 5 by Ms Sunday School from Great Look Have not used labels yet; however, labels are versatile and will add a finish touch to any item that I decide to place it on. Rated 5 out of 5 by shamilton66 from Perfect Touch for our Event I was so pleased with these water bottles labels! They are high quality and look fantastic!! Shout out to the customer service department...could not have gotten the right product, on-time without their help! Every person I spoke to was responsive and cared about making sure I was taken care of! Thank you for a great buying experience!! Rated 5 out of 5 by Rotary from Quick Turn around and quality printing! Labels arrived quickly and were easy to use! Very happy with product and service.